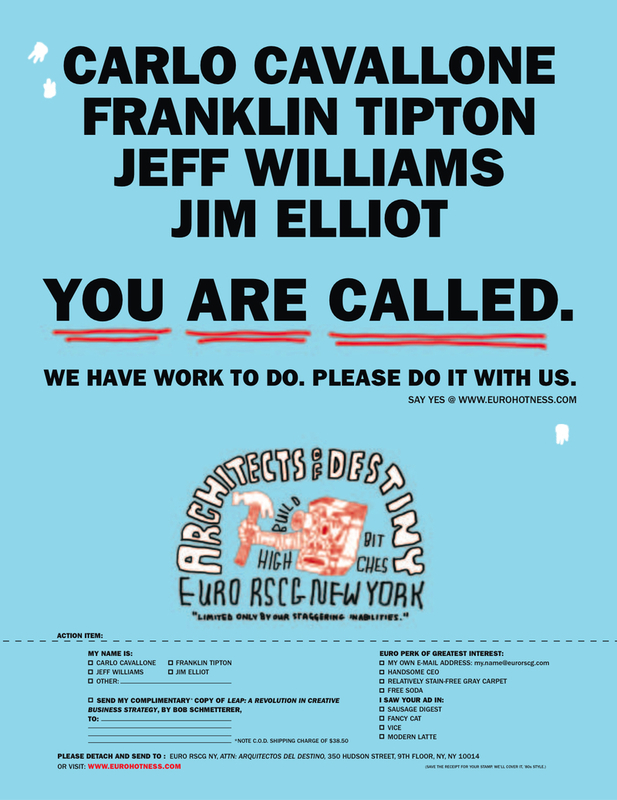 If you’ve never considered joining Euro RSCG’s creative department, perhaps now you’ll be sucked in by its “hotness.” An alert reader sent us this ad (click to see a larger version), which ran in Vibe Vice and appears to beckon four top creatives from other ad agencies—Carlo Cavallone, Franklin Tipton, Jeff Williams and Jim Elliot—to join the “architects of destiny” at Euro’s New York office. The four are instructed to “say yes” at EuroHotness.com. Judging by the videos on that site, this is meant to be a general recruitment campaign of some kind. One thing is clear: The print ad and the Web site spell Elliot’s (or Elliott’s) name two different ways.